Most people pull their children from the public school system because their child is struggling in one way or the other. They are falling behind in a subject, or they are getting bullied. Another reason may be that school isn’t challenging enough for your child and you pull them out to help them excel. My reason were none of the above. I was never against other people homeschooling, but it was something I vocally said I would never do. My kids were thriving in school. They got a long with others well and loved being with their friends. So why in the world would I pull them out? It is simple really, it is because God wanted me to. We all have a strength that we pull from. Some great power deep within us to fall back on when we need it. Whether we call it instinct, feelings, random thoughts, inner will, we all have moments where we dig deep and find a strength we didn’t know we had. I believe this comes from God, our Heavenly Father, a faith that has been rooted deeply in me. This faith feels my heart with immense gratitude. I can’t imagine raising my boys without little flashes of understanding, simple ideas that pop in my head, or the guidance that I receive daily. This feeling that I needed to homeschool my boys came at the beginning of the summer, soon after school let out. I started to have random little thoughts pop in my head which I quickly dismissed. I mean really??? Why would I home school my 5 rambunctious boys. These thoughts continued, and not only were there thoughts, but different things I read also encouraged me to homeschool my boys. I couldn’t help my husband with different things during the day. A hundred other voices were telling me not to listen. It got to the point that I couldn’t sleep at night and I was getting physically ill. I cried a lot! I talked with my husband, who agreed with me, that it would be a very hard thing and would take a lot of my time. Many hours were spent talking with a lot of other families who homeschooled their kids, trying to understand my own feelings. After 2 weeks of fighting this feeling, I finally accepted the fact that we were supposed to homeschool our boys. When this happened, I felt the weight of the world go off my shoulders! I felt peace and a sense of contentment and knew everything would work out. I started looking for curriculum to use, which was an incredibly overwhelming experience. Within a couple days everything seemed to fall in my lap. Different resources, friends, and curriculum helped me to get all set up for homeschooling my boys in the fall. There were so many unknowns that made me worry of how smoothly everything would go. Would my boys like it? Would they miss the social life at school? What are the chances of me going crazy? What would my 1 year old and 3 year old do? Somehow we did it and love it! This decision, that I was so quick to dismiss, has changed my families life. It has been the best thing that has happened to us. We have grown together as a family and my boys are best friends. Do we have moments when we want to run and hide? Absolutely! Its not all peaches and cream over here! Lots of times its salt and vinegar (which can be a tasty treat). We have learned, laughed, cried and grown together as a family and wouldn’t trade it for the world. The things I did before, when my boys were in school, somehow still get done. For me, what better thing could I be spending my time doing, then teaching my boys? 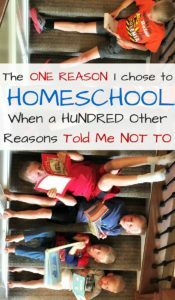 Now this post is not to tell everyone that homeschool is the way to go! Is homeschool the answer for everyone? Absolutely not! Every family is different and the need to rely on the spirit, or an inner strength to guide you as a family, couldn’t be more important than now. The trick is finding what is best for your family. If God leads you to it, He will lead you through it. For us this is what He is leading my family through. I had a friend tell me this about homeschooling. I have found so far in my first year that this could not be more true. I have learned so much about WHO I am and WHAT I am. There are many things I don’t like and some things that I do like. There has been days that I was grasping for anything to hold onto, trying to find anything at the bottom of the barrel to keep me going. It has been those moments that have made me stronger. During times that are difficult I remember the feelings I had, and then I remember WHY I am doing it. At this time, I put my head back on straight and keep running! We can all do hard things, and they slowly turn into something wonderful.